Bright red, pink, yellow, white, peach, golden orange, copper, cream…you will find all sorts of colors in the Minnesota Mum. Thanks to the University of Minnesota’s Mum breeding program beginning in the 1920’s. At first none of the plants that they were engineering would bloom before Minnesota’s first frost hit but they kept trying! The cushion habitat mum was the first patent of the U of M in 1977. “Plants are dome-shaped, with flowers almost completely covering the outside surfaces of each plant. Previous mums bloomed only at the top of long stems (upright habit). Within a decade, the cushion type became the dominant chrysanthemum plant habit worldwide.”- U of M Chrysanthemum breeding program. There is continued development of a different growth habitat mum like the wave hardy mum since right now most are the cushion habitat or upright habitat. Hopefully we see more of those soon! Sometimes Minnesota Mums can be finicky with our winters and some treat all mums as annuals but here are some steps to take care of your hardy Minnesota Mum so it comes up year-after-year. 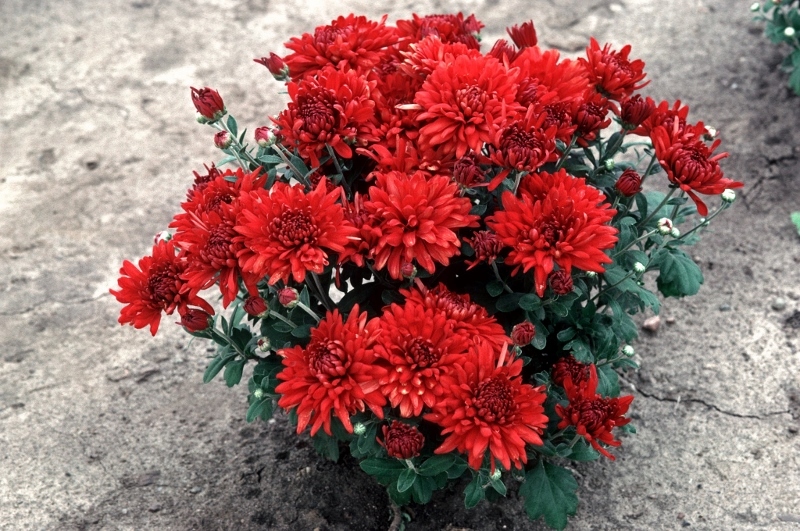 Plant your mums in well-draining soil. The cold may not be the killer of your mum but the ice around the roots if there is standing water when the ground freezes. Think about a sheltered location that can protect your mum from winter winds. Cover your mums with 4″ of leaves or mulch to give them some good insulation after the ground as frozen and there isn’t extreme fluctuations of temperature. Take off the leaves that you bundled your mum in if they haven’t blown away already. You can just snap off or trim off the dead growth being careful not to pull out or cut new growth. This is the time also that you can divide your mum. The outer new growth is the most vigorous and you may see little stray growths that are perfect for splitting. You dig down and snip off the new growth, leaving as much of new roots on as you can on the cutting and then pot them up in a clean pot and soil in a warm sunny windowsill for a few weeks and be sure to water but not too much. Do the finger test of sticking you finger down into the dirt on the side at least two inches to see if the soil is dry. Then you can plant them into the ground.